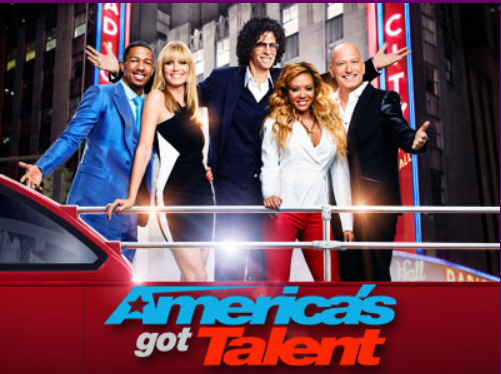 Tonight on NBC their hit reality talent show AMERICA’S GOT TALENT returns for the eighth episode in its ninth season where acts compete at Judgment Week in New York City. On last night’s episode, after long weeks of auditions, celebrity judges Howie Mandel, Mel B, Heidi Klum and Howard Stern got real with “Judgment Week. The task of separating one-trick ponies from entertainers who might have real staying power began. Did you watch the last episode? If you missed it we have a full and detailed recap, right here for you. On tonight’s show, the TOP 48 ACTS ARE ANNOUNCED DURING JUDGMENT WEEK, celebrity judges Howie Mandel, Mel B, Heidi Klum and Howard Stern narrow down the competition. Nick Cannon hosts this top-rated summer series which features a colorful array of hopeful future stars as they compete for a chance to perform at the famed Radio City Music Hall and win the $1 million prize. RECAP: The first catagory is the Kids Variety, first up is Adrian Romoff and he is 9 years old; he loves the piano and every time he plays a piece he tries to do it in the way the composer did. He didn’t know if people would like him at all, he’s 5 grades ahead of where he is supposed to be because he’s incredibly smart. Adrian goes up now and he begins to play his song. Howie mentions at the end that maybe it just isn’t enough, though he is good. Next up is Byamba’s Contortion Girls, they do their act, Howard thinks what they do is great but it felt a little underwhelming this time around. Next up is Kaycee and Gabe, they haven’t had much time to practice with each other but they are going to perform their best. Next up is Carter and Anika they are dancing together and right away Howie notices that it was a little messy in the beginning; their timing was a little off the whole time. Next up is the music groups category, starting it off is The Willis Clan and they are a big family band; there are 12 kids and the love performing together.They get up and start to perform. Howard says they make him smile so much,he loves them. Next up is Beach Avenue, they all love music with a passion and want to do it for a living; they are shocked to have made it through their audition and are bringing up another original song and if they go down they want to use their own material. Howard says they did well and believe they’re all good; though Howie didn’t like the song. Next up is Kieran and Finian Masterpiece singing an original song they wrote themselves, taking a big risk. Mel B like their song a lot though Howie feels like it might not have been smart. Next up is Jonah Smith, he isn’t really living the dream right now though he’d like to make a living with his music and his band. His drummer at the last second decides he’s not coming, he tries to go find a drummer to help; though his time slot is changed. Next up is Sons of Serendip, they all met in university and hope they can do this full time; they love music with a passion. Next up is Livy, Matt and Shammy; they decide to do a hip hop song in their own style. They wanted to take on a bigger challenge; Howie asked if what they did was unique and they personally think they are something different. Now it is Jonah Smith, they got a drummer last minute; he’s an old friend and rushed over. They haven’t had much time to practise but they are ready to perform anyways. Howard thought Jonah was absolutely amazing; he was 50 times better than last time. The next category is now the variety acts, first up is Dustin’s dojo with their hilarious parody of a karate dojo. Next up is Bob Markworth and his archery act, he claims to never miss; though he accidentally missed on balloon on his first shot. It just really didn’t go right for him. Next up is Top Hogs, the pig is doing math problems and he did well on the first two times but failed. Next up is Emanuel and Philip Hutcherson, they are doing an act on how religious people act pretty hypocritical though it was really bad. Next up is Flight Crew Jump Rope, they used to be two teams that went against each other but now came together to perform on the show. Next category is male singers, first up is Frank Dimitri singing Frank Sinatra and wants to live his dream of singing; he never tried before because of his stuttering problem. Next up is Jaycob Curlee and he is singing and it wasn’t the best; his nerves got the best of him. Next up is Justin Rhodes and he’s singing “I’m Only Human”, Justin feels the nerves completely hurt some of the notes coming out. Next up is Sal Gonzalez and music helped him survive after his service in Iraq where he lost his leg; he can’t live without music and knows he wants to make it further. Next up is Miguel Dakota and he is a college drop out; he wants to win the competition to be able to support himself and his own family. Next up is Paul Ieti and hewas so nervous his first time and was really sweaty, he was amazed that he did so well. He is from a small island in the pacific ocean and hasn’t seen his parents since 2012; but it’s too expensive to go back home. He wants to do this for them. The judges call Paul Ieti back out to talk to them, they tell him the singing category is very diverse and they feel like they already decided that they would like to take him through right now. Paul starts crying on the spot; he calls his family about the good new. Next up is the Dance Groups, first up is Bad Boys of Ballet; they get on stage and do their performance of a modern ballet. Howard wasn’t crazy about it though HOwie loved it. Next up is Baila Conmigo, a big salsa dance group filled with ages 5-31. Next up is Tic and Tac with their unique dance moves, it looked like a street performance but it was amazing. Next up is Jasmine Flowers, they are doing a traditional Chinese dance using the fans. The judges ask for the Baila Conmigo to come back out onto the stage, the group is very emotional hoping for the best; they are moving on to the next round. Next up is the Acrobatic Acts, first up is Acroarmy, ranging from the ages 11-27; their choreographer was on the first season of the show. Next up is the Xpogo Stunt Team, they do extreme stunts on pogo sticks; they are taking their act to more dangerous levels. Next up is Christian Stoinev and he is a hand balancer, he’s a fifth generation performer; he started at 5 years old and loves doing this with his life. He’s got a surprise for the judges. Now the judges are deciding who they want to move on to Radio City Hall and 48 acts made it through.